Reading the new issue of Road & Track today, with a very speculative article (as is usual with Sam Mitani, the “news” is all dated and appears to be not based on any actual research outside of reading Japanese car magazines and the web) about the new FT-86, the spiritual successor to the original AE-86. The FT-86, or whatever it will be named once it reaches production, is belived to use a 200 HP 2 liter engine with Toyota-style dual direct- & port-injection. 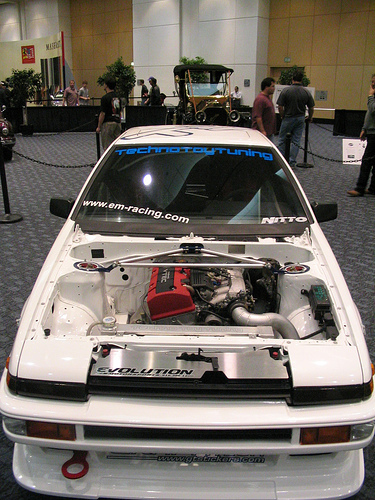 The original AE-86 used a port-injected 130 HP 1.6 liter DOHC 4. Times haven’t changed much, but 200 HP for a likely 3000-pound car isn’t much. Which conjured up a vision of a monster – why not put the state-of-the-art DOHC 2 liter engine into the original AE-86? By “state of the art”, we mean of course the Honda 2 liter S2000 engine: 120 HP/liter. We remembered having seen this done somewhere, several times in fact. It’s actually very common in Japan. The example below is an American swap, complete with the engine, computer, 6-speed manual, and dash gauges (closely slaved to the engine computer, they are very commonly reused in these swaps). As you can see, it’s very clean and looks right at home. And the power-to-weight ratio is certainly far ahead of the modern FT-86… and may stay that way unless Subaru puts their turbocharged STI engine into their version of the car. Something that is being denied at the moment. Unfortunate.